Civil wars make nations "vibrant". Ethnic homogeneity is boring. Yes there is carnage, misery and desperation. But whenever there is an interlude in the fighting, when there is pause in the shelling and bombing, citizens have an array of exciting ethnic cuisines to choose from. During lunch breaks, there is unity in diversity. Ethnic conflict only erupts for one reason. There is a failure to communicate, to understand that underneath, we all just human beings with the same aspirations and needs. We have to look beyond the superficials and see that we are all brothers. God loves every one of us, whatever language we speak or faith we follow. We must adopt the same attitude as that of a Parisian father who was interviewed on CNN. He stated that he refuses to hate the terrorists who murdered his son. To do so would repay evil with evil. Instead, he will endeavour to love them. To embrace them. When you do that he said, the walls come down. So if you love a violent psychopath, and turn the other cheek, he will give up his evil ways. Love conquers hate. Hope conquers fear. Violence begets violence. Risk peace, not war. I am fortunate to live in a community full of people like that Parisian, people who, as Justin Trudeau advised after the Boston bombing, would reach out to killers and help them overcome their social isolation, which is the cause of their anti-social behaviour. Do that, rescue them from their alienation, and they wouldn't take up terrorism. One man, a 70 year old immigrant from New Zealand in a wheelchair, typified this kind of thinking. When he overheard me warning a tourist about cougars, he interjected with the comment that cougars pose no threat if, in his words, "We just love them". Bears likewise. We hug trees, why not predators? He was one of the many people who urged that we settle Syrian refugees on the island without reservation. In response to a question about the security risk we might incur, the Kiwi assured us that if there was any terrorist was among them, the jihadi would soon change his attitude once he experienced the compassion and caring that our people had to offer. So you see, multi-ethnic societies can work. There can be harmony between psychopathic jihadists and liberals, between third world rapists and their German and Swedish victims. As Paul McCartney sang, "Ebony and Ivory, live on my keyboard in harmony — why can't we?" And as his fellow Beatle John Lennon famously speculated, just imagine if there were no countries (no borders too). If only John was alive to see the EU today, he could see his beautiful vision unfold. 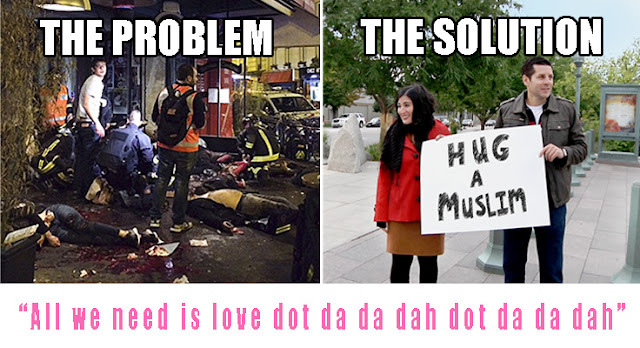 Now all do-gooders together: "All you need is love. All you need is love, love. All you really need is love. Dot da da dah...."